In the early spring, homeowners sometimes find big green or brown bugs crawling on the walls or flying around the windows in their homes. If they don’t recognize the bugs, homeowners might swat them or step on them. They quickly learn why these bugs are called “stink bugs”. The Stink bug species that Ashcraft Termite and Pest treats for is the Brown Marmorated Stinkbug. It is a non-native species that originated in East Asia. The stinkbug is a fruit and vegetable eater and has no real predators in Virginia. The treatment is a one time treatment annually designed to deter and prevent them from getting into your home once they vacate the fields and orchards in late summer/early fall. 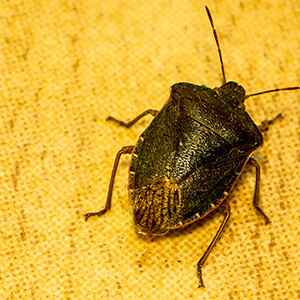 Stink bugs tend to invade homes in the fall when the weather starts to turn cool. The only time to effectively treat for stinkbugs is around the end of August through the time when they “swarm”, usually end of September to mid October. Keeping the stink bugs from entering your home in the fall would keep you from having a problem with stink bugs in your home in the spring. If they aren’t treated in the fall, they may cluster on the outside of the home for warmth. When they find holes or cracks, they move inside the home. They find hiding places in attics, crawl spaces, and inside of wall voids. The bugs stay hidden through the winter. When springtime comes, the bugs start to move around. They seek a way out, but they often come out inside the living space of the home. Homeowners can help prevent stink bug invasions by making a thorough inspection of the outside of the home. Doors and windows should be checked for cracks and torn screens. Weather stripping can help seal gaps under exterior doors. Attic and crawl space vents should be checked for torn or missing screens. The most effective control for overwintering stink bugs is prevention. Once inside the wall voids, they are extremely difficult to control. They do not feed or reproduce while indoors but may reappear on a warm winter day or in the spring. Once a home experiences a stink bug invasion, they are likely to have a re occurrence in the next fall. A pest control professional should be contacted help develop and implement a plan to keep this from happening.